The current Apple TV is 7.7 inches squared and weighs 2.4 pounds. Next Apple TV has been described as "an iPhone without a screen"
(Wired) -- For its next Apple TV, Apple may ditch the set-top box form factor and instead cram a media player into a tiny device running the iPhone OS, according to Engadget. The blog cites an anonymous tipster who claims the next Apple TV has been described as "an iPhone without a screen," containing only two ports -- the power socket and the video-out -- and the same internal architecture as an iPhone (A4 CPU). 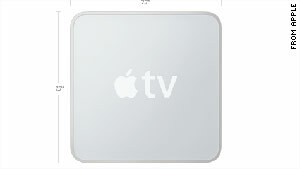 The next Apple TV is also rumored to feature 16GB of Flash storage and support for 1080P HD. The device will cost only $100, according to the tipster -- significantly lower than the current $230 system. Engadget did not provide a time frame of when to expect the device. Most interestingly, Engadget claims the device will have a strong focus on cloud-based media, meaning most video you view will be streamed from the internet. That's plausible, given that Apple is building a gigantic data center and the company recently acquired streaming-music service Lala. Some sources have also said that Apple is planning to reboot iTunes into a streaming media center. In conference calls with investors, Apple has repeatedly referred to its Apple TV as a "hobby," implying it's still a niche product that has yet to be a blockbuster hit. If the rumor turns out to be true (and we find it to be very plausible), then this certainly sounds like a compelling revamp of the Apple TV. Engadget's rumor follows Google's announcement of Google TV, a web TV platform based on the Android operating system. Recent moves reveal that Apple and Google are becoming fierce rivals, competing in the mobility space, maps, and advertising. The next battle could be for streaming media.